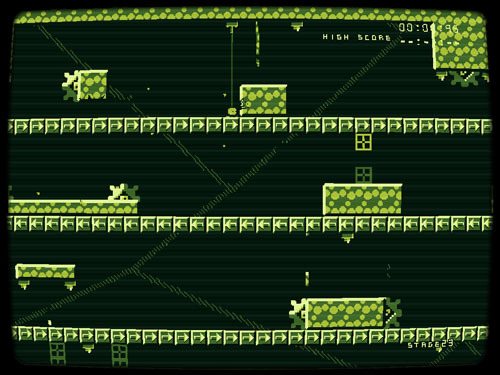 A game by kass-stwa for PC and Mac, originally released in 2018. 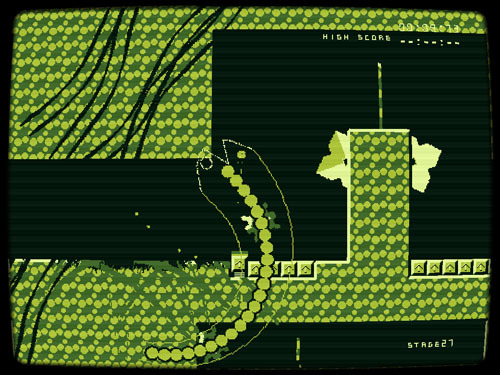 Heads Run is a precision platformer starring an unusual protagonist who is essentially just a little green head that bops quickly along the ground. The game is a follow-up and a refinement of the developer’s previous release, Porter, which starred the same platforming hero. 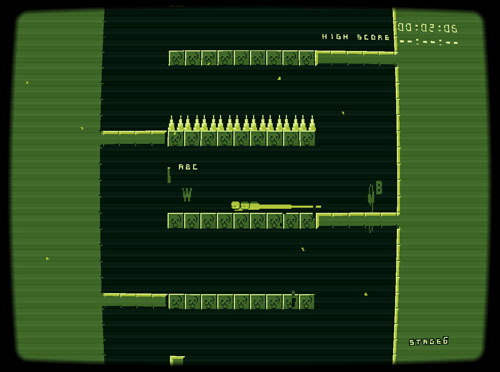 As before, the game is displayed in multi-shade “greenscale” with a grainy CRT-style filter and curved edges. Where the original game offered 20 short levels, Heads Run offers 50. Every level is designed to allow completion in a matter of seconds, with some of the opening areas offering completion times below 20 seconds. Later levels get longer – and more challenging – requiring that players make efficient use of their full moveset just to survive, let alone make it through quickly. As in the original game, the player character moves extremely quickly, with a bit of inertia in place when speeding up and slowing down. This makes the character a bit more unwieldy than those found in other platformers, and requires a great deal of finesse on the part of the player. There is little space between standing still and moving so fast that you barely have time to react to what’s around you. You will often fail when entering new levels, but levels are short and restarts are instant, resulting in very little lost gameplay when killed. In true speedrunning fashion, players are given a character with a lot of versatility; levels reward players who make the most of it, and punish those who don’t. 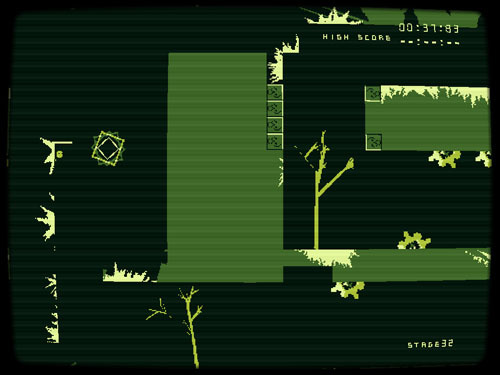 For instance, the player has the ability to cling to walls by jumping against them and continuing to press FORWARD. Letting off the button causes a grip meter to wear away slowly, and once it is drained, the player character falls back down. In the hands of a skilled player, this stickiness can be used avoid traps and enemies, and allows him to choose whether to dash away or fall down. On the other hand, this design means that the player will be slowed considerably if he runs into a wall rather than jumping over it, as getting unintentionally stuck can cause him to lose precious seconds if he’s going for a high level ranking. The player has a dash maneuver that he can execute on the ground or in the air, and this allows him to move horizontally at a very high speed. In open areas, this can speed up the player’s movement, and it is also used to break through certain kinds of blocks. 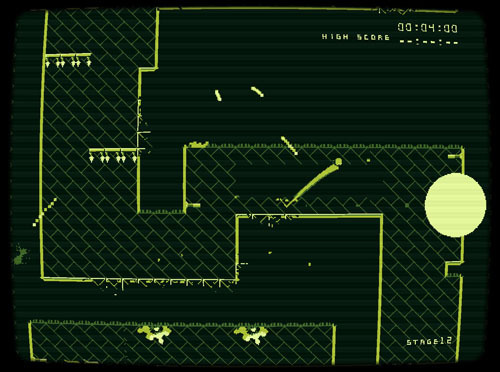 The dash maneuver also interrupts a jump, giving the player additional control over his movement and allowing for more complex level designs, such as sawblades on the ceiling and floor that require the player to jump and then perform a dash before reaching the apex. Players are able to wall jump up vertical surfaces, triangle jump up narrow passages, and use the dash maneuver to move horizontally away from the wall without requiring the use of directional buttons. Wall dashes allow for more precise movement through danger-packed environments, but similarly punish players who react too slowly. 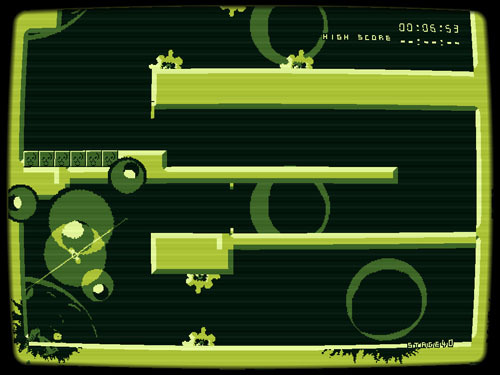 Attempting to dash toward a wall can backfire if the player hits the wall and then performs a dash, which will send him flying backward. As such, players must quickly alternate between directional presses, jumping, and dashing, with many levels requiring players to alternate movement strategies in rapid succession. In certain levels, the player can activate a powerup that grants him a double jump. This powerup is not available in most levels and sometimes only appears partway through the level. Levels that have the double jump powerup tend to be a bit less claustrophobic, as players can cover greater heights and distances with their jumps, allowing platforms to be spaced farther apart. This extra jump gives the player some additional midair control, and the design of the environments takes this into consideration, requiring precise use of the double jump. Interestingly, you can string dashes and double jumps together in any order with a jump-dash-jump or a jump-jump-dash, allowing for some dastardly environmental challenges that force you to consider how to properly finesse the controls to do your bidding. All enemies are invincible, so players must avoid roaming monsters, dodge past missile-firing turrets, and time their movements properly to slip past lasers as they activate and deactivate. Often, challenges revolve around luring enemies or obstacles away to allow safe passage, such as enemies that hone in on you, or rotating lasers that always spin toward your position. 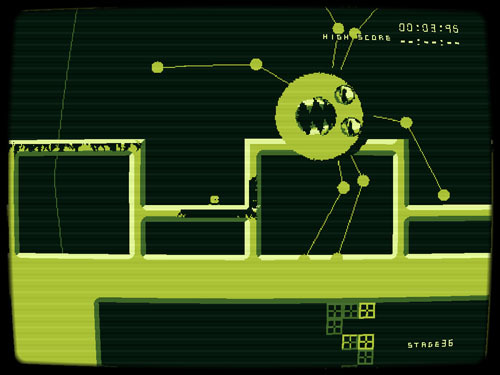 As in the previous game, there are skull blocks that emit spikes a half-second after the player character touches them, requiring that players avoid slowing down while running across them… and also avoid running straight into a wall and getting stuck and subsequently drilled through their favorite head. 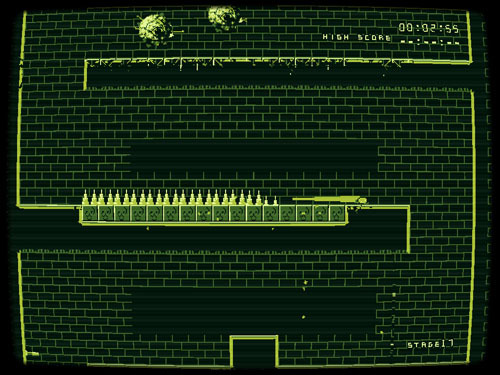 Some blocks can be destroyed with a dash, while others must be touched and explode after a few seconds (often placed in rooms with missile turrets so you can’t stand still for long), and there are blocks that alternate between solid and transparent when the player bops a certain block in the level. Sometimes the player must find keys to open the path forward, charge through rows of conveyor belts, or deal with moving platforms. The game introduces numerous frightful monsters that chase you around the level. Players are often faced with creatures that pursue them, offering only a second or two lead time between the player character and deadly fangs, pincers, or unidentifiable blobs of swirling color. These creatures are relentless, forcing players to stay on the run to avoid death, and some are triggered when the player touches something in the environment... usually chasing the player back through the area until he reaches the exit. While Heads Run offers a similar visual style to Porter, there are several new graphical effects in play, especially when it comes to its terrifying monsters. 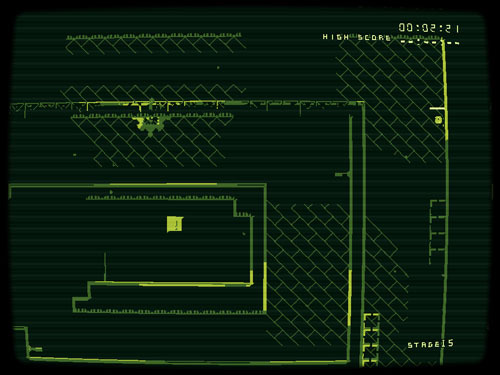 Additionally, walls and floors will occasionally show cracks as the player runs across them, and missile impacts sometimes cause lines to run through solid objects. 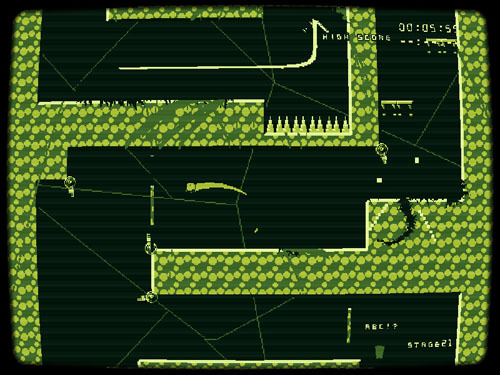 There are also some background elements that move around and graphical effects that offer distractions to players attempting to focus on making a speedy run. 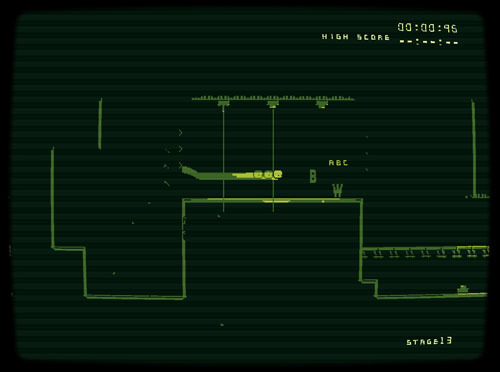 A small number of levels are dark and do not appear until the player touches walls and floors, similar to the design of INK, and these are a bit out of place compared to the more speed-focused levels. Not all levels offer linear paths forward; often, the player must retrace his steps to reach an exit after grabbing a key or flipping a switch that alternates solid/transparent blocks… often leading to added challenges as lasers and other traps are opened to the player. Some areas have spiral designs, while others require players to complete multiple horizontal dashes or cross back over their own paths – adding more challenge when enemies are giving chase – and a few areas have teleporters that transport players suddenly to new areas. 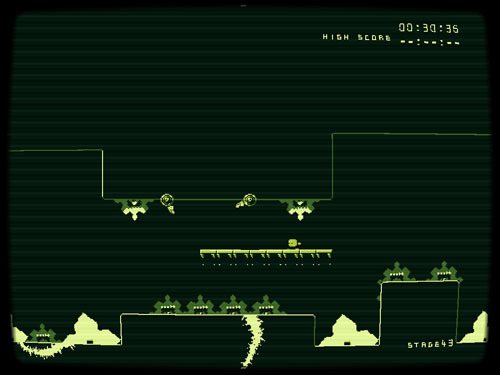 Difficulty escalates between each 10-level set, often placing the player in larger environments or against big bad enemies. Once these tougher challenges are completed, the difficulty drops back off a bit. For players wishing to better their level completion times, a ghost of the player’s best run is loaded when making a repeat attempt. This shows the player how well he is faring against his former best. 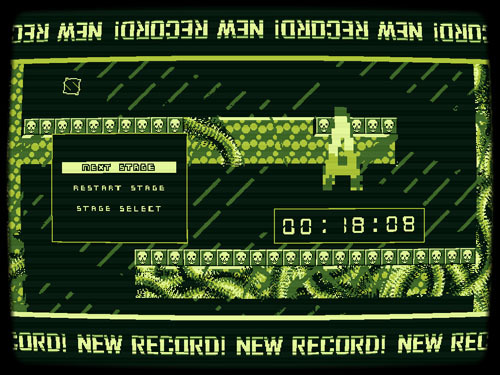 Upon completing the game, a ghost of the level’s record time is loaded. Completing the game also allows you to change the visual effects, enable a faster Turbo mode, and play harder variants of each level… if you’ve got the head for it. Heads Run was developed by “kass-stwa” who also developed Porter and the mobile version of that game, called Jump Porter. Music for the game was composed by “kass-stwa” and “junblur”.